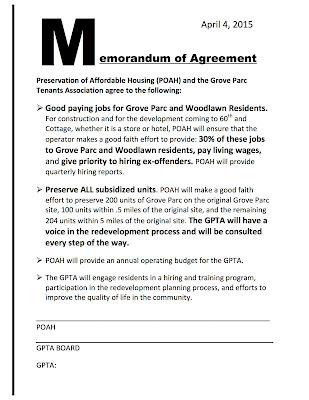 The Grove Parc Tenants Association, a member group of STOP, won a historic victory in getting the owners of their complex, Preservation of Affordable Housing, to sign a legally binding Memorandum of Agreement (MOA) around the $250M redevelopment of their housing complex. 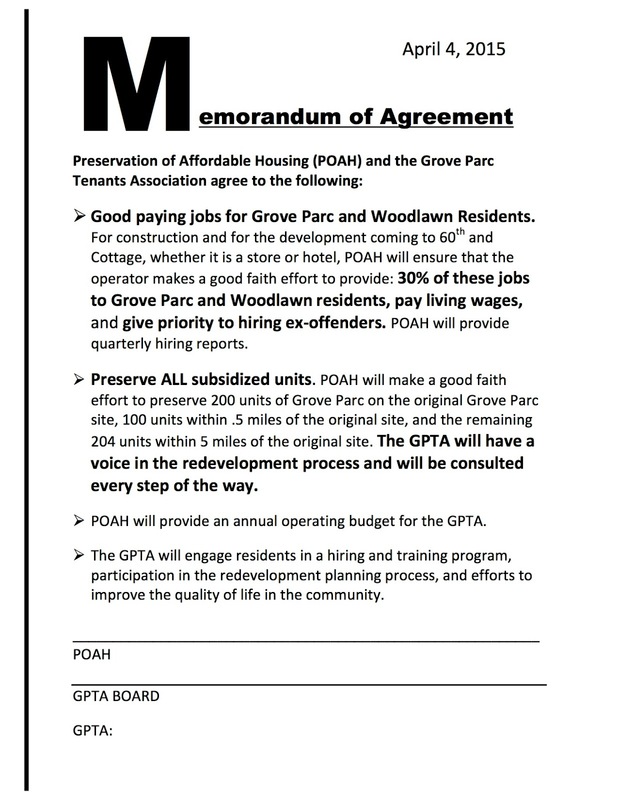 The MOA lays out a commitment for: 1-1 replacement of all 504 subsidized units, 30% hiring of Grove Parc and neighborhood residents for all jobs created through the redevelopment and input in redevelopment planning. This agreement is over 10 years in the making and represents what is possible when tenants come together to fight for their homes and communities. In 2007 the owners of Grove Parc and HUD were prepared to foreclose on the property and displace all of the residents. Today thanks to the hard fought organizing of Grove Parc residents and allies their homes are being redeveloped and the residents have the right to return and benefit from the jobs being created by the development.